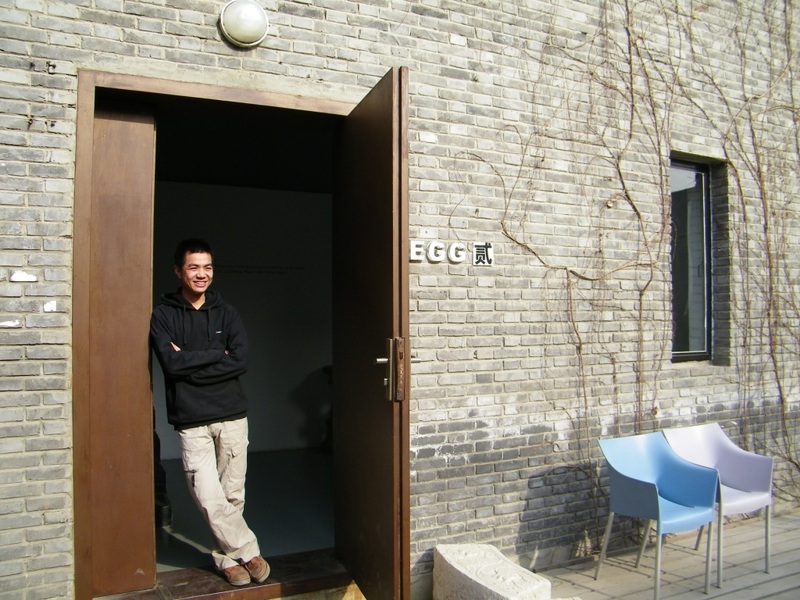 Yu Jing is the 26 year old Artistic Director for Egg Gallery in Caochangdi Village, Beijing. In addition to his gallery duties, he produces his own iconoclastic artwork, employing an eclectic variety of media to showcase his flippancy toward artistic and societal establishments. A sampling of his works and related comments follow, along with an interview. Artist comment: I created an activity modeled after a children’s game which involves chasing and finding other players. For this activity, I created an agreement which stated the terms of the chase – one person would attempt to escape from the other, who would follow in pursuit. If the pursuer still had the other in their sight after one hour, the pursuer would be awarded 100 RMB ($15). 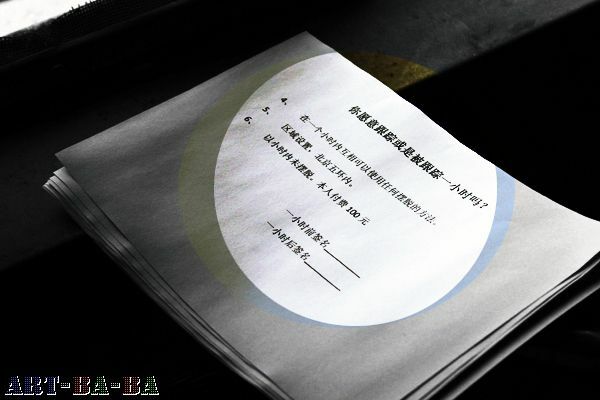 Players had a territorial limitation and were not allowed to go beyond the 5th Ring Road in Beijing. The purpose of this activity was to break the conventional social conversation pattern. When one usually meets a stranger, the conversation begins with “Hello, how are you, what’s your name?” Instead, I asked “Will you stalk me?” I approached about twenty people, five of whom expressed interest and one of whom actually participated. He failed. Artist comment: There is a well known essay (The Lotus Pool by Moonlight 荷塘月色) by Chinese writer and literature professor Zhu Ziqing 朱自清. It’s about Jinchun Garden on the Qinghua University campus. It is required reading for Chinese elementary school students. My intention was to make fun of it and change the image of this lake. I brought a cooking pot to the lakeshore and cooked a pot of noodles, which I then placed in strips on top of a rock face adjacent to the lake. The Chinese word 面 most commonly means “noodles” but also refers to personal weakness or softness. With that in mind, I was targeting the traditional Chinese education system (represented by the venerated lake) as being “面” or “weak”. Artist comment: While attending art school in Xi An, I lived off-campus and accumulated a small collection of personal possessions which would not go with me upon graduation. Just before I left, I decided to entomb them in my bed, which I poured concrete into as a forcefully symbolic farewell to my university days. 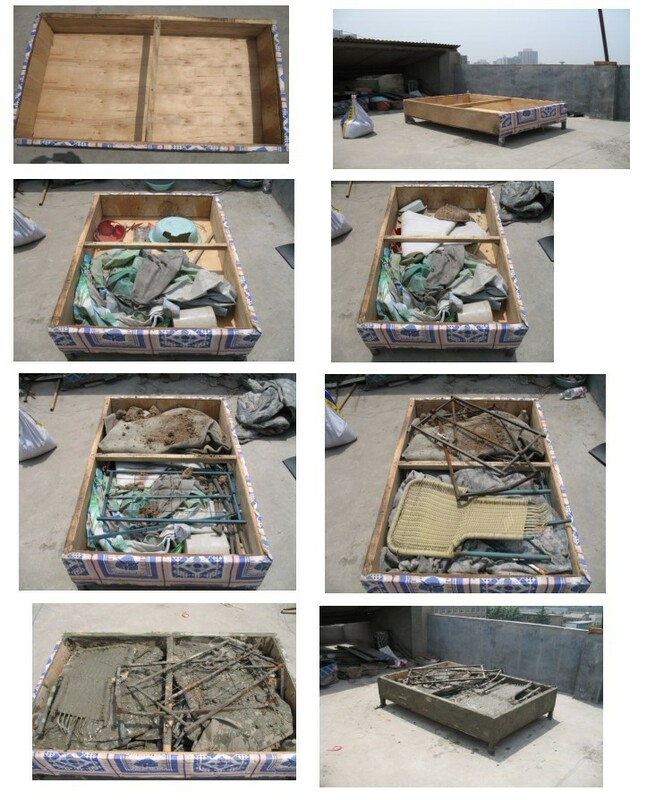 My landlord found out after I left and was quite upset, but I was already in Beijing by that time, so nothing happened. Artist comment: This was a secret show at the 798 art district in Beijing. Featuring five other artists, it took place after hours at a gallery, unbeknownst to the gallery management. We used flashlights. 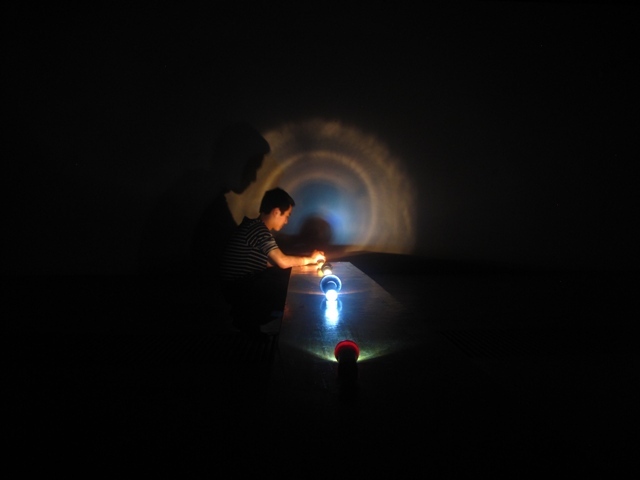 My piece portrayed a circle of light as a target, which can easily be erased with the flick of a switch. This is control. The ease with which the light could be turned off paralleled the secrecy of the show, which could disappear without a trace. Artist comment: It’s actually not a lake – just a pond that grew larger after a rain. I chose to represent it as a lake, from my viewing position. 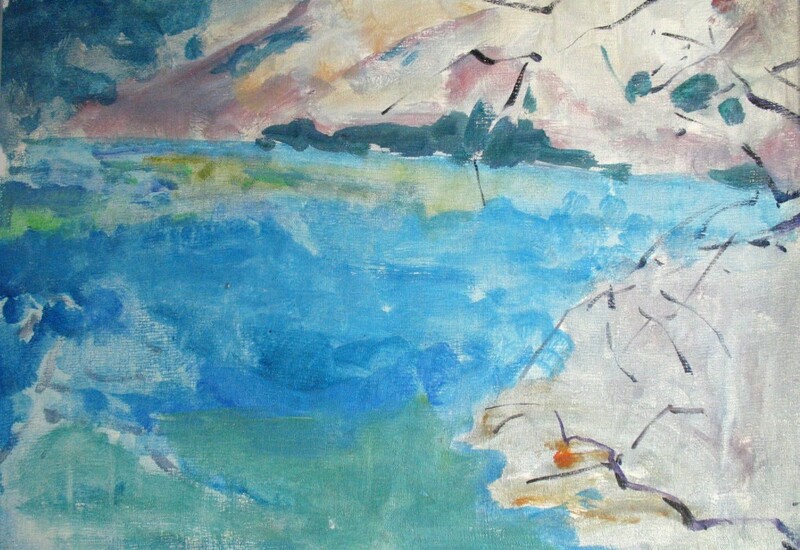 This painting was part of a series of six depicting this environment. Upon viewing the series, one of my art school classmates came to the realization that he was a better viewer of art, as opposed to a painter. He wanted to buy them, but I didn’t feel like selling to him, so I listed them at a high price in order to discourage him. A year after graduation, he took the money he had saved from his IT job and insisted on paying me for the whole series. He still hasn’t taken possession. Yuyang, Pingjiang County, Hunan Province (湖南省岳阳市平江县). It’s a small town. I’m a big fan of Hunan cuisine. What’s your favorite Hunan dish? La jiao chao rou 辣椒炒肉, spicy green pepper and pork strips. My parents run a small retail business that sells domestic goods. They were born there, have been living and working there all their lives and will probably die there. I actually grew up with my grandparents in a village in a mountainous area. The local economy is agricultural-based and I grew up poor. I had no computer, no television to watch and no toys to play with. Instead, I would ride pigs and cows and steal cucumbers from the surrounding farmland. I also chased and killed little animals with my friends. This is just what every child did there. Looking back at it now, I realize how cruel it was. Rabbits, wild cats, chickens, frogs. We would also track down animal nests and destroy them. Do you think there is any connection between your current work as an artist and the fact that you had to find inventive and unusual ways to amuse yourself as a child? I seldom reflect on my childhood, but yes, I think so. I grew up without established rules and adult supervision, so I ran wild. In my work, I like to break rules and change them, playfully. To alter things. Perfection is the conflict between opinions. This conflict is one of life’s ideals. When did you get interested in art? What was your first artistic attempt? I began painting in my fourth or fifth year of elementary school. The other students painted trees and I painted stumps. My painting of a nature scene was included in a children’s art compilation intended to promote the Chinese National Day. After high school, I studied oil painting at Xi An Academy of Fine Arts 西安美术学院 . As an artist, do you have a method? What is it? My philosophy is that art really can’t be taught in school – it is personal. Feedback is vital. I don’t believe you can create art in isolation, by yourself in a room; it is necessary to go out in society to observe reactions. This is how I get artistic ideas. With regard to methods, I use an open mind and a great variety of materials – not just the oil painting method I was trained in. Every available artistic medium is used, whether it be video, installation etc. The form is irrelevant. It is important that you not limit yourself by your choice of material and just break through and be playful. Do you have a specific process for obtaining artistic inspiration? There is a Chinese saying about how extreme idleness produces pain. I disagree. I believe prolonged idleness is actually beneficial in cultivating inspiration, contrary to the traditional Chinese belief. This may involve just sitting in one place for hours until I get an idea. I avoid distractions, which comes from two sources: school indoctrination and interpersonal relations/social rules which define a person. The resulting behavioral patterns limit creativity. Is there an art installation you have visited that really impressed you? I heard about an installation entitled “The Long March” which featured a spinning wheel mounted to an engine on a wall. The spinning wheel left friction marks in the wall. (Note: “The Long March” refers to a series of military marches by the Red Army led by Mao Zedong in the 1930s, to evade opposing forces). Do you think Chinese artists face cultural barriers when trying to reach foreign audiences? Yes, we face great difficulty in this area because Chinese artists are not confident enough to play art as a game. They do it as a business. This creates a cultural exchange problem with the international art circle. There a four well know contemporary Chinese artists who have achieved success abroad. Gu Wenda 谷文达, Xu Bing 徐冰, Cai Guo-Qiang 蔡国强 and Huang Yongping. These four artists fully employ uniquely Chinese elements in their works, which is the reason why they have entered international art fields. They rely on Chinese heritage to communicate. They can’t make their names recognized without using these Chinese elements. I feel this is a sign of their unconfidence. Will any of your work be exhibited soon? I’ll be anonymously exhibiting some work this April in Milan, Italy (see above flashlight installation). Why won’t your name be attached to this exhibition? Because it’s fun to waste this opportunity. Ordinarily, an artist will feature their name in bold type, but I refuse to follow. Has anything of great importance taken place in your life lately? Yes, I’ve been single for four or five years because I’ve been focused on work. Two weeks ago, I met a girl through a mobile application called Mo Mo that allows you to connect with other users who are nearby, simply by shaking your phone. It is typically used to find one night stands. We were both new users of the application and, coincidentally, she attended the same school as me, after I had already graduated. In fact, she even knows my best friend but we had never met each other. We’ve been dating for a couple weeks and I am quite happy. This was written by aleconner. Posted on Saturday, April 7, 2012, at 21:12. Filed under Interviews. Tagged art, artist, Beijing, Caochangdi, China, Chinese art, citizen journalism, contemporary art, installation art, public interest, vox populi. Bookmark the permalink. Follow comments here with the RSS feed. Post a comment or leave a trackback.